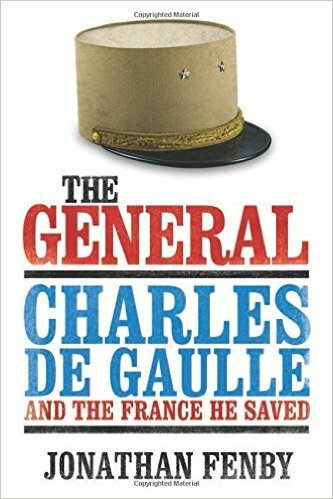 Enjoy what you read on Forgotten Weapons? Please consider supporting me on Patreon with $1/month! Thanks! Mannlicher 1905 prototype military rifle. This is a composite photo, so the muzzle end looks a bit “off”. Photo courtesy NFC, Leeds, UK. Before we can really take a close look at today’s rifle, some background is necessary. Ferdinand von Mannlicher was a very successful Austrian gun designer, with patents on several major ideas, and successful rifle and pistol designs. His “packet” clip-loading system was the world standard for some time, and was used in many early bolt action rifles (and in the US M1 Garand, for that matter). His series of automatic pistols was not quite so popular, but was probably the number 3 system in the world at the time (behind the Mauser and Bergmann guns). Our story today begins with his 1897 pistol, which was his first one to use a locked breech. It was short-recoil operated, and used a tilting block to lock. We previously did a video on the carbine version of this pistol (which uses the exact same mechanism), and I would recommend taking a look at that video to see how it works, and the 1905 rifle uses the same principles: Mannlicher 1901 Carbine. That pistol was chambered for a small pistol cartridge, and what Mannlicher wanted to do was scale up the system for a full-power rifle cartridge, in an effort to win some military contracts. He built at least one prototype in 8mm Mauser before his plans were unfortunately interrupted by his death in January 1904 (the patent on this rifle was actually issued to his widow on behalf of his estate). The rifle uses a short recoil system, in which the barrel and bolt assembly travel backwards together for about 15mm. 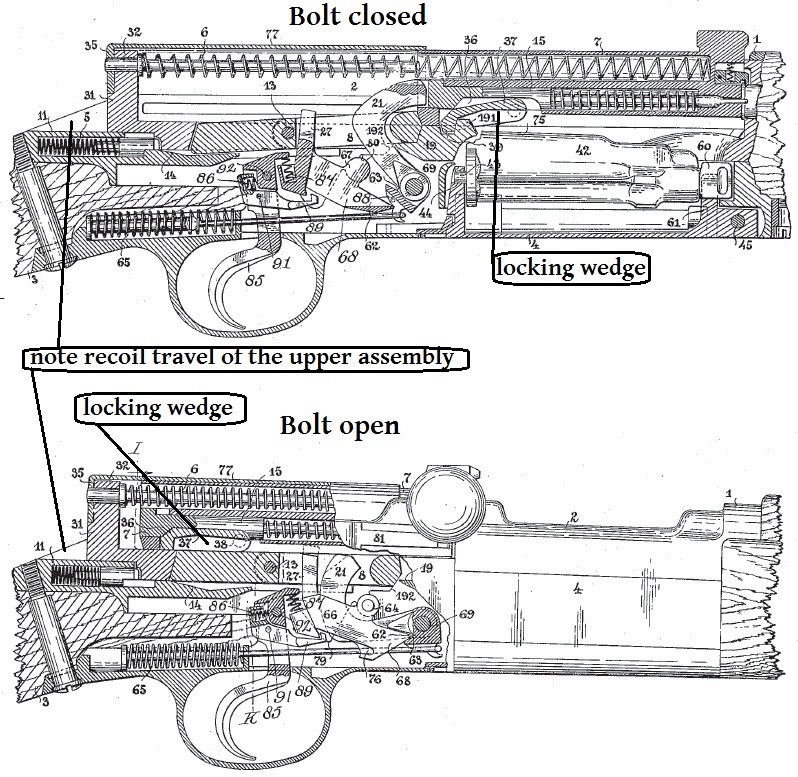 The two are locked together by a tilting block which pivots on the bolt and locks into a shoulder which is attached to the barrel extension (this is backwards from the pistol, in which the wedge pivots on the frame and locks against the bolt). As with the pistol, the trigger and magazine assemblies remain stationary, and the upper half of the rifle recoils back above them. 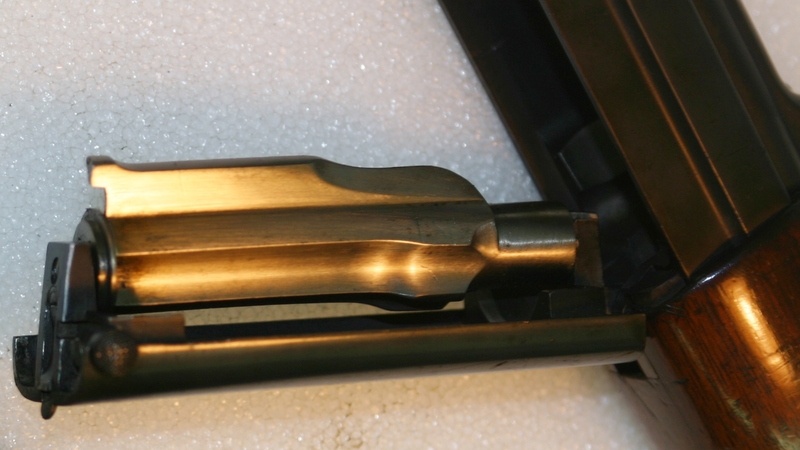 During that recoiling movement, the tilting wedge is pushed up flush with the bolt and out of engagement with the locking shoulder, which allows the bolt to continue moving backwards when the barrel stops. It then extracts and ejects the empty case, as in all semiauto actions, and a recoil spring pushes it back into battery, loading a new cartridge. One other neat feature of the rifle is that it uses a Schönauer type rotary magazine, much like the 1903 Greek Mannlicher bolt action rifle. The Mauser-style internal box magazine was well known by the time this rifle was being built, but Schönauer was Mannlicher’s friend and he no doubt preferred the rotary system to anything made by his competitors at Mauser. The military intent of this rifle is clear from the bayonet lug, front band, sling swivels, and Lange rear sight, all made to the same pattern as the standard-issue Gewehr 98 rifle in service at the time. This particular example is housed at the National Firearms Centre in the UK (aka the Pattern Room), and I would assume that it was sent to the UK for testing by Steyr back when it was made. Whether it was ever actually tested and how those tests turned out, I have no idea. My reference books on Mannlicher rifles don’t mention this design, so all I really have to go on are the photos of the rifle and the patent which accompanied it (see below). Curious, maybe I missed it, but how many were made and what do you think one would sell for? I like the mix of the Gew98 with its innovations. I don’t know on either question. There can’t have been very many made; and this particular one is the only one I’ve seen reference to. The price would be awfully high as a result, but possibly tempered by the fact that the gun was a dead end developmentally. Charles Ross was very influenced by Mannlicher. You can see many similarities between this and Ross M3..
That’s a very interesting observation. I was sort of hoping this would be a model with a forward moving barrel and standing breech, which I seem to remember finding a patent for (my collection of blowforward patents is on a seperate hard drive, and this more than makes up for not being a blowforward in other ways). If Ross drew heavily on Mannlicher’s work, then that would go part way to explaining his design. Judging from the cutaway diagrams and description of the operating cycle, the Mannlicher 1905 seems to be a sound and solidly-built design with few vices, if any, and much potential. Perhaps it met a dead-end fate due to a combination of Mannlicher’s untimely death and the usual bureaucratic, logistical and manufacturing inertia regarding the mass-production and adoption of a new firearm? No more Austria Felix then. The empire was almost always almost broke, and the+military budget was regulary+vetoed by the Hungarian parliament with the view to weaken the union towards a split and Hungarian sovereignity. So bad, that the Austrians developed a new brass alloy with high tensile strength to recycle their obsolete muzzle-loading cannons into nitro-proof breechloaders. With 9 official languages, 20+ ethnicities it must have been a nightmare to run an army of conscripts regardless of the Steyr-Mannlicher M95 and the Skoda guns they produced but could not afford for themselves. That’s a very good point you brought up about the impact of the socio-economic and political factors of the time that may have contributed significantly to the demise of guns such as the Mannlicher 1905. Thanks, Fidel! Besides the Browning High Power, how many guns have made it to production after the death of the inventor? The Hi-Power was really a Browning/Saive collaboration from the start, so one of the inventors survived to complete the project. And in non-military guns, the Browning Superposed was completed by Val Browning. Existence of this rifle is new discovery to me as I feel affinity to von Mannlicher’s guns (both of my grandfathers were fighting with M95s). I have been looking at details of both phases you supplied (commending you for that!) and try to make sense out of part you term as “loking wedge”. I am not sure if I understand it right. In my grasp it is link with part no.8 at front of setup which actually blocks the bolt; it’s sort of strut. This in turn seem to be kept in place by piece no.19. Lastly mentioned is in recoiled phaze way down; it may be that its position is governed directly by barrel. Yours mentioned part no.37 (locking wedge) looks as if it assures that bolt does not ‘overtravel’ foward (in case there is no cartridge in chamber). Military semi-auto rifle in that period of history is rarity. What comes to mind as a companion design may be Mondragon’s rifle. As Mondragon is based on different operating concept it also seems to be more complex. On balance, I venture to say that von Mannlicher’s semi-auto is really elegant piece of design. It can be argued, with degree of success, that “recoil operated firearm” by its essence does not diminish accuracy. Samples among rifles to support the case are: Johnson’s semiautomatic rifle (as accurate as Garand M1 with lesser felt recoil) and .50cal Barett M82. 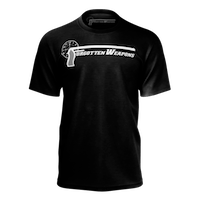 The phenomena decreasing accuracy are many from which recoil force (maybe just flinch in expectation of it) and mechanical conditions (such as barrel wear and straightness) are most significant. Also, training and physical and conditions of user are more important than anything else. Oh yes, and almost all self-loading pistols are based on recoil action – some with astonishing accuracy. Tests will tell you. To add to my previous post: please note what movement of upper receiver you have on average AR15. This is due to fact that you hold bottom assembly to your shoulder while the top with attached sights is connected to it by push-out pins, subject to movement in many directions. There is no way around it – to assure assembly and disassembly plus interchangeability, there have to be clearances. Term ‘clearances’ are often interchanged for ‘tolerances’ which is incorect. balance of factors goods and near to goods. Strongarm, thanks for your response! I do agree with your general perceptions as to what is seemingly more practical and accepted design type of today. The main advantage of gas operated system is that you have opportunity to pre-arrange when you want events to take place due to dwell and they happen predictably. On the other hand, the question of essence ought to be: why to have extra hardware (in form of gas mechanism), if you can be without it? In addition, there is little to clean in its absence with all related benefits. Also, let’s face it: the term “recoil operated” contains scope of wide detail arrangement; its possibilities are not necessarily represented by what we have encountered so far. I believe there is still field open to creativity. Issue of running clearances is another topic, not necessarily related to previous. As we know all weapons, especially those used by militaries are required to provide for intrusion of dirt, mud and even snow to function under variety of conditions. This definitely presents a detriment to their accuracy. The lock wedge design of this rifle also reminds me of the short lived Mannlicher M1886 (11mm) and M1888(8x50r) rifles. The Schönauer-type rotary magazine is an interesting feature. Would that system be comparable to the Krag-Jorgensen or Johnson magazines? The mags which Ruger use on the 10-22 and 77-22 are based on the Schonauer mag. depending upon how schonauer mags are constructed, it is possible to support each case seperately, so that strongly tapered or rimmed cases are presented correctly at the feed lips, and rims do not interfere with each other. I’m trying to find a copy of Otto Schonauer’s patent, so far without any luck. Interestingly, the patent examiner for Ruger’s .22 rotary mag, doesn’t cite Schonauer, but does cite his fellow Hapsburg subject, Karl Krnka. Hi Keith! Could find for me what is method used to drive either of magazines? On this particular design it looks as though the bolt drives it, but it is not specifically stated. Tnaks. the description of the Mannlicher 1905’s mag begins at line 58 on page 3 and continuing to line 55 on page 4 in the patent. it is operated by a torsion spring in the spindle. Krnka’s mag’s unique selling point was that it fed in line with the bore axis, rather than from one side of the bore axis. It then serves as a feeder and the projection on top of it doubles as an ejector. Rotary mags appear to have been very popular with designers around 1900, the Savage 99 lever action also has a rotary mag. How many rounds did the magazine hold? I believe it held 5 rounds, but I could be wrong. I have this carbide with the very clear inscription… “Hembrug 1905”..(Not 1906) and I’m up against the wall trying to find another one like anywhere? according Mannlicher Wikipedia..they changed names in 1904…Now I’ve spent considerable time searching this matter, but the only guns I can find like it are 1906…Must be a first edition…lol…And I dare anyone to show me another one with the same date.. PLEASE? After many years, I finally have a selection of shirts and cool stuff for sale! Just in time to buy something after Christmas, how's that for timing? Check it out, and don't miss the limited-time Puckle gun shirt! Site developed by Cardinal Acres Web Development.